SEOUL, South Korea, March 28, 2019 /PRNewswire/ — Songuo Motors introduces the revolutionary NeuWai brand and its new passenger car, truck, SUV, motorcycle and scooter models with advanced technology, groundbreaking materials, electric and alternative-fuel drivetrains and sustainable construction. Twelve NeuWai vehicles were unveiled at the 2019 Seoul Motor Show. Production of the first model will begin in 12 months. All models shown at the show and others currently in development will go into production over the next 18 months. Company leaders doing business on 5 continents and in 30 countries will meet on March 29, 2019, to sign agreements to distribute NeuWai vehicles. Several of these companies will also commit to building assembly plants to supply NeuWai vehicles in their region. "We weren’t satisfied with currently available metal, aluminum and composite body technologies," said Shin. "We created a proprietary system to mold composite body panels in color with a glossy exterior." This allows for consistent body color without painting, solving the century-old challenge of painting body parts in an assembly plant. Primary manufacturing of NeuWai vehicle components and systems will take place at the company’s 430,000-square-meter (4.6-million-square-foot) manufacturing plant in the National Hi-Tech Industrial Development Zone in the City of Dezhou, ShanDong Province, China, to create semi-knock-down (SKD) kits. A sporty 2-door and versatile 4-door ultra-compact car will stand out from the crowd. A unique, modular, configurable vehicle is sized between the passenger cars and a 1-ton truck. The NeuWai compact SUV will meet the needs of active families, with room for 4 people and their gear. 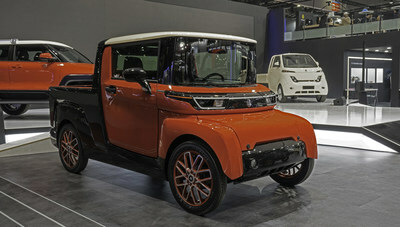 The NeuWai 1-ton pickup will provide stylish capability.